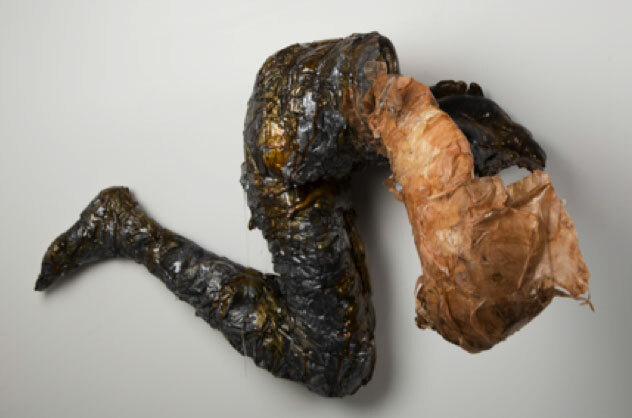 As two figurative artists, Christine Sopata and Shailinn Messer both use figure in unconventional ways to test and expose the perceived limitations of the body. The artists reconstruct and defy the assumption of body using mixed mediums, sculpture, and traditional means of portraying the human form. The works are fragile and vulnerable, yet full of strength and perseverance as they deteriorate into the frame or surrounding space. Whether it is a photograph capturing a moment of a person long since gone, the aura an object comes to process over time, or the rubble of a place once inhabited—each of these objects manifests an intangible energy, which is beyond words. Beyond Body is a show less about figurative art, and more about what the figure contains within. Using body as a vehicle driven by a life-force larger and far more complex than can be fully comprehended, the artists seek to capture a single moment of consciousness before it rapidly escapes their grasp. That is to say: to make tangible and sensory of the intangible and non-sensory; to attest to the possible- and impossible-ness of human, and to break the mold of body and expose it from the inside out. Sopata is a recent graduate of SMFA and a visual storyteller balancing narratives with allegorical imagery, inspired by the Bible, historical writings, nature, and ephemeral happenings. Her work documents the progress of healing and understanding the mind and spirit within the flesh. The series Sopata is exhibiting at Factory Mark Gallery, “Incomplete Metamorphosis Stage Two: Face to Face,” documents the progress of healing and understanding the mind and spirit within the flesh using the practice of self-casting and putrefying the surface through sculpture and mixed mediums. Messer is a New England-based artist who recently received her BFA from SMFA following an education in psychology. Working with archival imagery and analog photography, Messer reconstructs the human figure in an attempt to piece together distorted memories and make sense of confusing feelings, playing with gendered expectations and pushing the perceived limitations of the human body. Her practice in drawing is the foundation of her work, incorporating photographic technique and the mark making of a skilled painter to create a body of work that reflects the admiration of all.